In honor of Bastille Day, I’m featuring a few of the objects from our collection that memorialize Marie-Joseph Paul Yves Roch Gilbert du Motier, the Marquis de Lafayette (1757-1834). As a hero of both the American and French Revolutions, Lafayette was celebrated during his lifetime and memorialized afterward. The objects in the Bostonian Society’s collection which honor Lafayette fall into two distinct categories – relics (things touched or used by the man himself) and mementos produced for sale to the general public which featured this hero of both the American and French revolution. Many of the relics in the collection relate to the visit Lafayette paid to the United States in 1824-5. These include a table cloth from the banquet for the dedication of the Bunker Hill Monument and a matching napkin upon which has been handwritten "Benjamin Smith, June 17, 1825/ This cloth was once spread for the brave Lafayette/ And when round it again patriot spirits have met/ May America's champion, her pride and her boast/ Inspire each heart, be the theme of each toast/ And when fill'st high their glasses may they never forget/ To drink to the health of the good Lafayette/ Inscribed on the Lafayette table cloth, spread at the banquet at the dedication of the Bunker Hill Monument". We also preserve a lamplighter from the room in which Lafayette slept when he visited Boston and stayed with Governor William Eustis and a punch bowl from which he is said to have drunk when he and George Washington visited Richard Gridley. 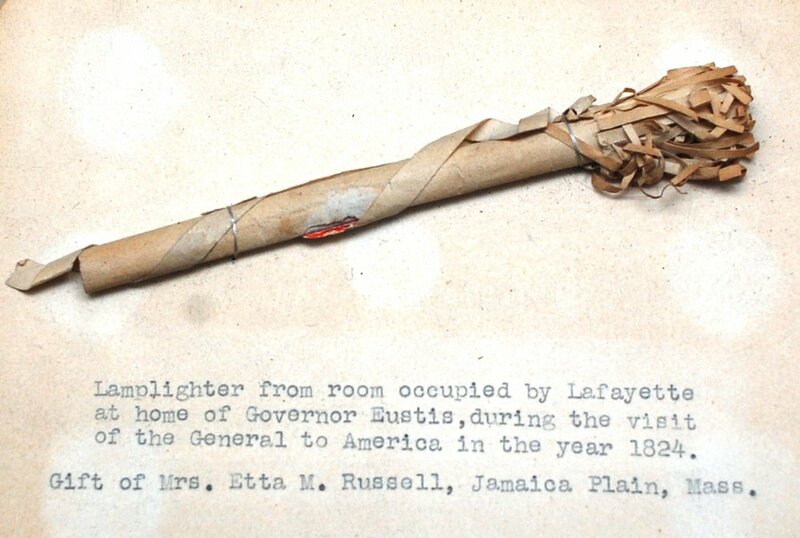 We also preserve several mementos which memorialize Lafayette. These include a papier-mâché snuff box, featuring a picture of the General and specifically harkening back to the 1790s, when he was named commander-in-chief of the National Guard of France. Although the date of this object is unknown, the motif of Lafayette surrounded by clouds indicates that this is likely a memorial object, produced after the death of Lafayette in 1834. We also have a pair of kid gloves and a satin sash, each emblazoned with an image of Lafayette, worn by a fan during his visit to the United States in the 1820s. But by far my favorite of the mementos is a pitcher from 1824, which depicts Lafayette on one side and George Washington on the other, and features an eagle with the words “Republicans/are not always ungrateful” between them. 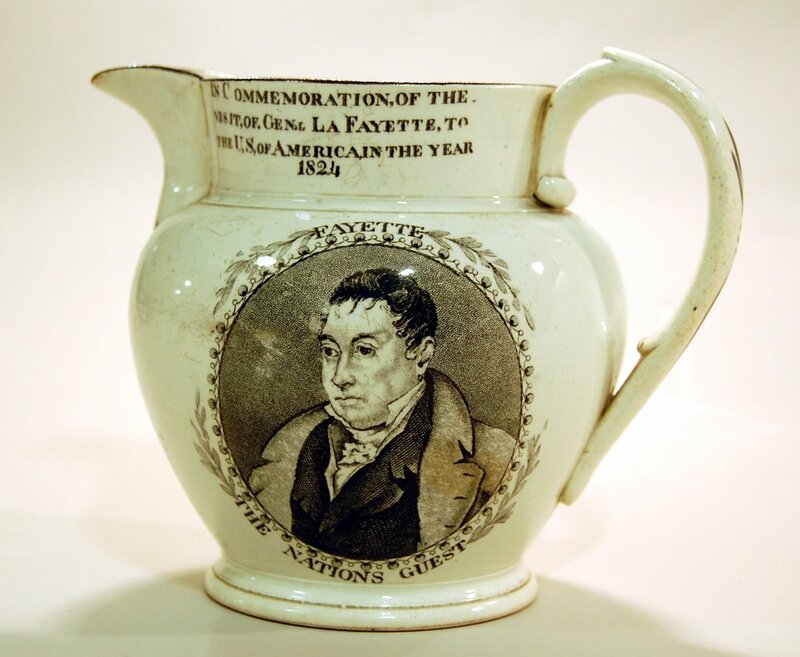 This pitcher also dates to Lafayette’s visit in the 1820s and it identifies him as “The Nations Guest”. The fact that people in the 18th and 19th centuries thought to keep these relics and that we collected these mementos are a tribute to the enduring legacy of Lafayette. Vive la France!